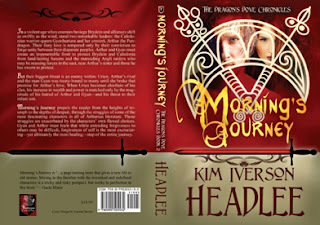 Book Media Kit meme c2016 by Kim Headlee. Photo c2015 by nastia1983, Depositphotos ID 64327933. 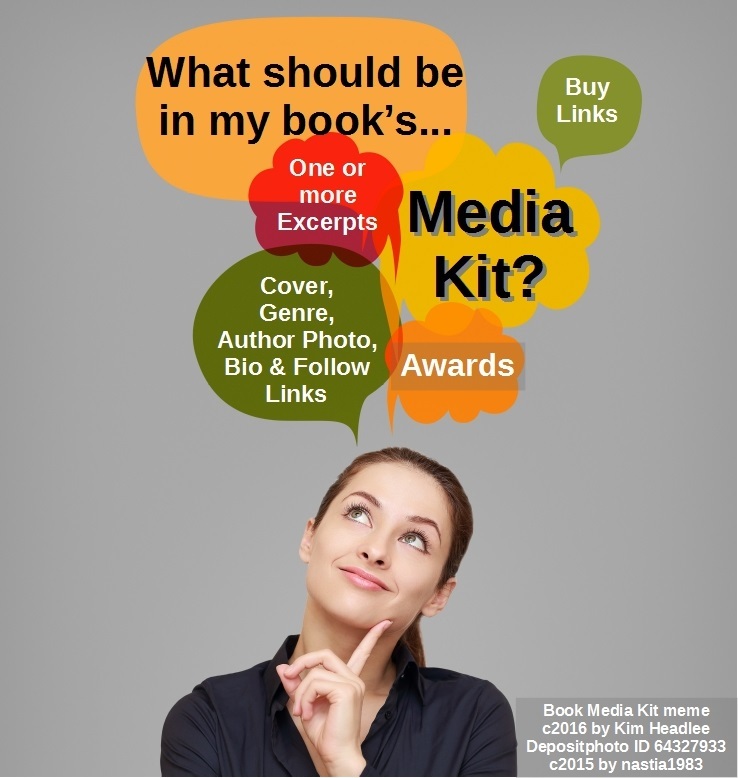 Tips for crafting your book's Media Kit! It's a collection of materials an author assembles to inform journalists and—these days—bloggers and tour hosts about their books for promotional purposes. When I began my publishing career in 1999, the media kit was a two-pocket folder assembled to exacting specifications. In the left pocket, front to back, was tucked the author's photo, followed by contact information and bio, and any prior publications and awards. The right pocket contained the most recent release's cover flat (the marketing tool produced by large traditional publishers consisting of the print book's wrap cover with selling points printed on the back), book information such as genre, series title if applicable, and retail price, tagline and synopsis, press releases, and reviews. Some authors prefer to assemble one media kit that describes all of their books. If your collection contains more than three books, however, you might be wise to consider establishing a separate media kit for each book or series. This makes it easy to approach bloggers who might be interested in running a spotlight of one of your books on their blog. If you employ blog-tour companies, more than likely they will send you their media kit format. Ask her or him, as a professional courtesy, whether it's acceptable to substitute the media kit you've already prepared. A subset of the digital media kit—minus frills such as book trailers, animated covers, teaser graphics, excerpts, and sample chapters—may be sent to potential reviewers along with the book's MOBI (for Kindle) or EPUB (for most other e-reader types) file. Remember to double-check the reviewer's submission guidelines, however, and only send the materials the reviewer requests. If there is anything you like to include in your book's media kit that I haven't mentioned here, please leave a comment and let us all know! by Mark Twain as channeled by Kim Iverson Headlee. Check out its great new YouTube book trailer! on display in booth 1434 at 2016 ALA Annual Conference & Exhibition. 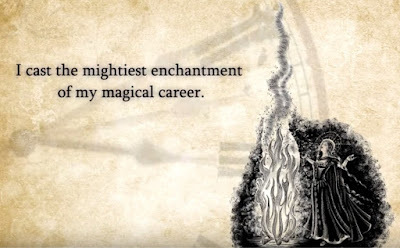 View my award-winning science fiction/fantasy time travel sequel to Mark Twain's A Connecticut Yankee in King Arthur's Court in Orlando, FL June 23-28! 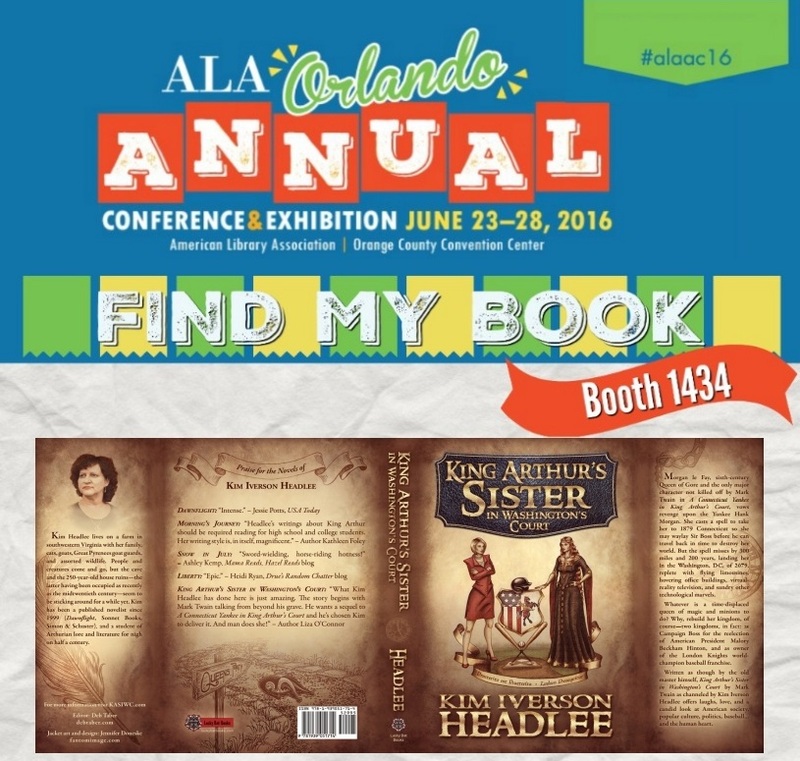 Can't make it to the American Library Association's annual conference this year? 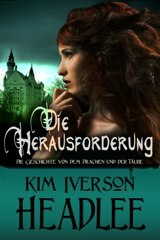 Enter this great giveaway for print and e-books! After a two-year hiatus, I will once again be appearing with my books at the annual Chautauqua Festival being held in my hometown of Wytheville, VA. Nestled in the mountains of what I fondly call the "knuckle of the toe" of the Commonwealth of Virginia, Wytheville guards the crossroads of interstates 77 and 81 and draws travelers from all across the mid-Atlantic region and beyond. The eight-day Chautauqua Festival is chock full of activities for all ages, including hot air balloons, antique cars, a pet show, an art and photography show, a creative writing competition, craft workshops and demonstrations, kids' crafts, music, food, and fun. All concerts and many exhibits are free; some of the workshops and exhibits may ask a small fee to cover the cost of materials or for staging the exhibit. Before I launch into my appearance schedule, I would like to mention a festival event I plan to attend as an audience member: the farewell performance of local Celtic band Night Crossing. The lead singer, Denise Hoots, is a friend and was my daughter's high school art teacher. 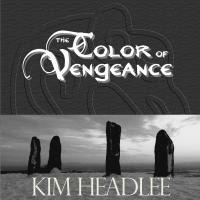 I have used, with permission of course, some of their music to grace the audiobook editions of The Challenge and The Color of Vengeance. Night Crossing will play their final notes together at 7:30 p.m. on Tuesday, June 21. Wednesday, June 22, 10 a.m. – 4:00 p.m.: Chautauqua Artist in Residence, on the lawn of Elizabeth Brown Park outside the Wytheville Community Center. Thursday, June 23, 10 a.m. – 12 noon: Signing and selling my books at the Black Horse Artisan Guild, 115 East Main St, Wytheville. Friday, June 24, 12 noon – 8:00 p.m.: Chautauqua Bazaar, inside the Wytheville Community Center, main level, 333 Community Blvd, Wytheville. Saturday, June 25, 10 a.m. – 8:00 p.m.: Chautauqua Bazaar, inside the Wytheville Community Center, main level, 333 Community Blvd, Wytheville. Though the summer solstice isn't for a few days, summer on the Headlee Farm is in full swing: the garden is planted, major inroads have been made on the weed beds (not the kind that would make us any money, but I bet I made you think twice :D), and we already have several face-cords of firewood stacked and ready. We're either going to have the mildest winter in Appalachian Mountain history, or we'll be snowed in for weeks and still won't have enough firewood to carry us through. In today's excerpt of Raging Sea, I introduce the fortress of Caer Gwenion, located on the site of an AD first century Roman fortress in northern England dubbed Vinovium and known today as Binchester, near the town of Bishop Aukland. 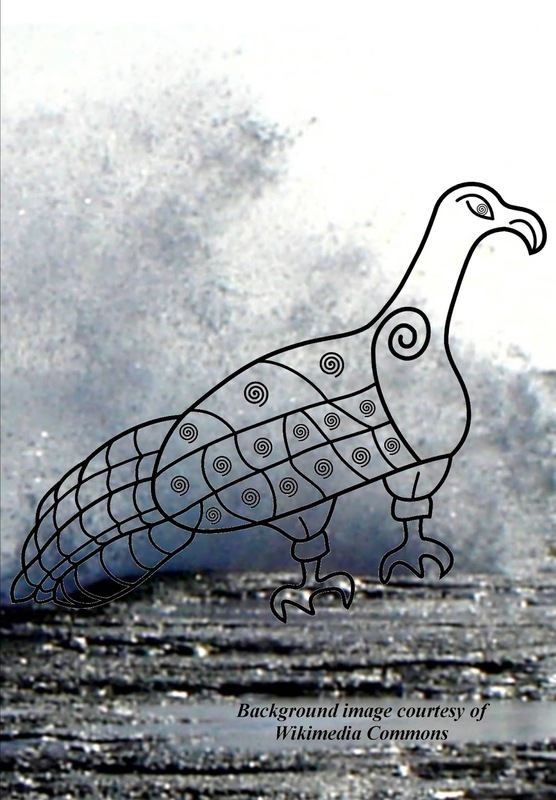 The battle fought between Arthur's forces and the Saxons at Caer Gwennion will take place in a future book, but the seeds of the idea are sown in this installment. Finally, he rose and bade them follow him to his private reception chamber. The same guards that had conducted her and her father into Cissa’s presence accompanied the party. At the doors, Cissa ordered his men to wait outside. Cued by the king’s entrance, thralls appeared through doorways to adjoining rooms bearing food and drink, which they arranged upon the table before retreating. The entire time, Cissa stared at a deerhide map of Brædæn tacked to one stone wall. Ælle and Camilla helped themselves to wine goblets from the table and joined him. Camilla pressed another goblet into the hand of her almost-uncle-by-marriage, and he nodded his thanks. Cissa tapped a scarlet X above the crook of a river at the edge of blue-marked Eingel territory. On all Saxon maps, scarlet represented holdings controlled by or allied with the Bræde Dragon King. This particular X sat just a little more than two score miles south and east of the Dragon King’s home fortress. “The White Fort?” Camilla dared to ask. Ælle shot her an annoyed look, which she ignored. “Caer Gwenion in the tongue of the Brædeas,” Cissa supplied. Camilla noted the we and broke into the biggest grin she’d felt in weeks. “Thank you!” She hoped the kiss she planted on Cissa’s bewhiskered cheek conveyed the full depth of her appreciation. A campaign into northern Brædæn was going to require months of planning and staging—perhaps even a year or more. But she saw Cissa’s participation as a sign that the gods were on her side in this endeavor. With that being the case, she couldn’t possibly lose. 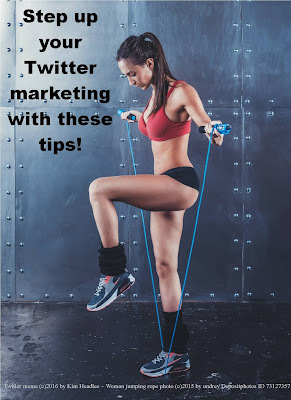 Back in February, I blogged about Twitter marketing for authors in this post. It focuses mainly on how to manage your Twitter account to maximize your network following and grow your list of people who faithfully retweet your posts. Today I'm diving into the nuts and bolts of creating better tweets for your books. If you're just getting started, you can read some solid general tweeting advice (if a bit dated, since Twitter has abandoned its longer-tweet plan, and thank heaven for that mercy) by Teena Thach for the Socedo blog. For those of you who have been around the Twitter block a time or two, I invite you to consider the following examples. 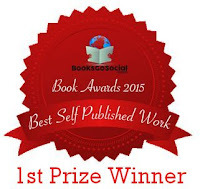 Does that tweet induce you to click on the book's link? Maybe, if you're already a fan of the series or are familiar with the author's other work. Even a small town with a stupid name like Horsenose can have big-city drama. Note that I had to shorten the subtitle and didn't have room for the author's name. 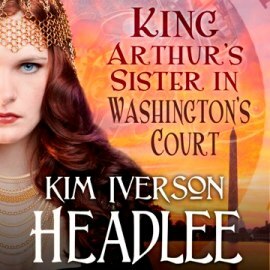 I prefer to embed my Twitter handle (@KimHeadlee, and thanks for the follow! :) in my tweets whenever I have room for it so I can track its reach. But then I was fortunate enough to claim a Twitter handle that's recognizable as my name. The other issue with the tweet in Example 1 is that the shortened link expands to point to the paperback edition of the book, rather than the Kindle edition I coded into my version. That's not a "Twitter sin" per se, but I've learned that most customers will be more likely to impulse-buy the less expensive digital version rather than paying far more to kill a tree. Note also that I didn't bother to shorten my link. That's because Twitter dedicates 23 characters to a link regardless of its length. If you don't believe me, try it! Okay... so we've got a romantic comedy-adventure story. What's the title? Removing the extra space between the link and the hashtag leaves 28 characters in which to give the title. Potential customers need to see an item at least seven times before deciding to buy it. They won't know what to buy if you don't tell them! Note that I reworded the hook as a question that cannot be answered by either "yes" or "no." Why? The yes-or-no question is the weakest form of writing because it's the easiest to dismiss. You do not want to give potential readers any excuse to dismiss your books! Of course you can also incorporate review blurbs and excerpts in your tweets. In every case, select language designed to engage and entice your readers. 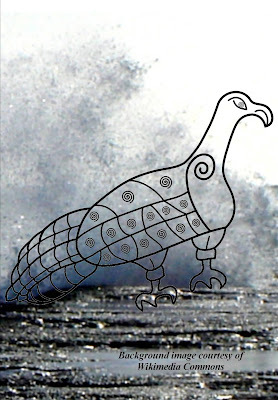 The Picts—Scotland's ancient aboriginal inhabitants who likely migrated to the Highlands from India, a theory based on root language similarities—created some amazing art left behind on their standing stones. The subjects of these etchings are varied and vast in scope. Geometric shapes such as arcs, circles, and rods; domestic items, including combs, mirrors, tongs, cauldrons, and mirror cases; people of various social classes and occupations; wild (including boars, bears, lions, birds, and fish) and domestic animals (bulls, dogs, cats, horses, and geese); flowers; and my favorite category, mythological beasts. 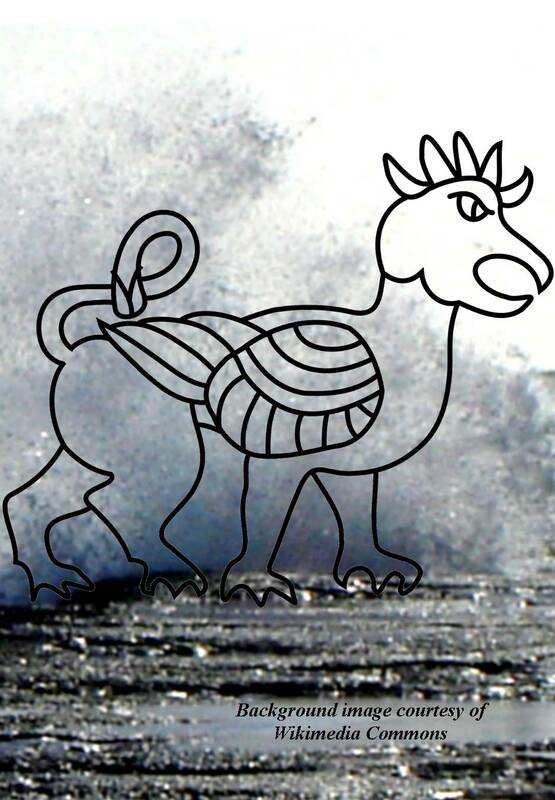 Dragons, centaurs, "Nessie" (or an elephant, or a dolphin; no one is quite sure), and, yes, griffins, such as the design I've selected for the Saxon warrior-princess Camilla, shown on this page. 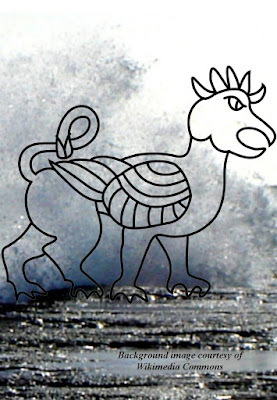 Camilla's glyph is adapted from a photograph of the stone designated as "Meigle 26", now located on display in the Meigle Sculptured Stone Museum of Meigle, Scotland. In today's excerpt of Raging Sea, Camilla wishes she could climb into the hole dug for one of these monuments and then pull the stone back on top of herself. In spite of the steel and leather battle-gear that covered her from the neck down, Camilla felt naked as she strode beside her father King Ælle, traversing the length of Wintaceaster Hall, flanked by King Cissa’s royal guardsmen. It seemed as if all the West Saxon nobles’ gazes were fixed upon her, brimming with pity. Not only had that demon-queen Guenevara killed the man she loved, Camilla’s attempt to exact revenge had failed in the most humiliating way conceivable: as an attack—a failed attack—on the wrong woman. 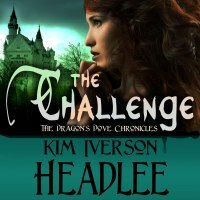 Her cheeks burned afresh from the memory of her father’s wrath when he had confronted Camilla about the incident, against the Dragon King’s own sister, no less. It was a miracle that Ælle hadn’t removed her from command of the Cymensora garrison, and an even bigger miracle that she’d been able to convince him to accompany her here, to request the help of King Cissa. 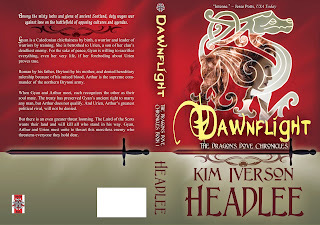 She and Ælle reached the platform where Cissa was seated upon his throne, and they saluted him with dips of their heads. Cissa returned the nods with one of his own and bade Ælle to state his business. Camilla wanted to crawl into the nearest hole to get away from the glare of that piercing gaze. BookBub meme c2016 by Kim Headlee. Chalice photo c2010 by Marco Varro Depositphotos ID 8031476. 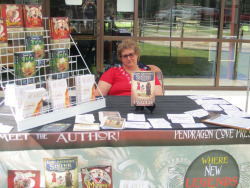 I've been marketing my books for three years now via several methods—blog tours and hops, Facebook parties and ads, informal author spotlight exchanges, Twitter, and most recently, email promotions, paid as well as free. Free exposure is always good, of course, even if only one person sees your ad. When you're shelling out your pennies, however, the adage that "marketing is about exposure, not sales" (which is true) is tough leather to chew all the time. The good news is that if you have a great book that has been professionally edited, features a professional cover, the Moon is in the Seventh House—and there's a big enough spot in your advertising budget—you might be lucky enough to score a BookBub "Featured Deal." Why do I equate paying hundreds of dollars for a single book advertisement with luck? 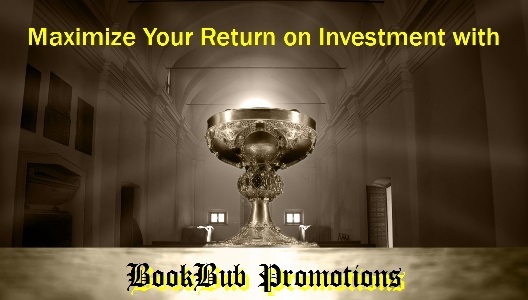 Because the BookBub promotion is the only marketing tool I've discovered to date wherein sales revenue has exceeded the investment in a timely fashion. Immediately: Decide on how long you want to keep the deal in place (I recommend no more than 5 days, inspired by the Kindle Unlimited free promo model), and confirm your assigned feature date. Immediately: Relay any specific instructions not already conveyed. "Let us know if there’s anything in particular we should be aware of about your listing — for instance, if there are multiple editions of the same book available, or if the cover has recently changed." (source: BookBub Deal Checklist). Immediately: If you code your own e-books, begin making sure all embedded product links are up to date for all major platforms (Amazon, Nook, iTunes, etc. ), and all available books. If you have several titles, prioritize as follows: the featured book, other titles in the series, then all your other books. If you don't code your own e-books, ask whether your formatter person/company will do this for you, whether they can complete the work at least three days prior to your BookBub feature, and how much those updates will cost. 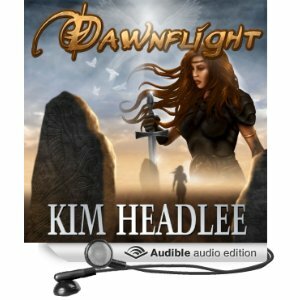 Immediately: Reschedule any upcoming Kindle Unlimited promotions that might adversely impact sales related to the featured book.You're already paying an arm and both legs to feature one book; let your readers have a shot at any free books either before or after the BookBub promotion, not on the same day. My rule of thumb is to wait three days before running another KU free promo. As soon as possible: Set up free and paid advertising with as many other email promoters as will fit within your budget. My favorites in the "paid" category include Books Butterfly (to get the tracking link), Book Barbarian (if the featured book is SciFi or Fantasy), Robin Reads, BookSends, Genre Pulse, BookZio, and Fussy Librarian. You may elect to schedule these promos to kick in a day or more after the BookBub promo to help keep your momentum going. Oftentimes a potential customer will decide to purchase an e-book if it has a decent Amazon rank already. 10 days prior: drop prices on Nook, iTunes, Kobo (you can schedule the Kobo promo in advance), Google Play, and Smashwords for the FEATURED BOOK only. Ask your friends to "report lower price" to Amazon so that its regular Kindle price gets marked out in favor of the matched price. This is another marketing trick to help maximize the deal's "wow factor" in the customer's mind. 1 day prior: Check the featured book's Amazon product page to see if they have matched the price of Nook, iTunes, Kobo, etc. If not, then manually lower the price. Day of: Relax. Don't start checking for sales until noon ET. From the BookBub Deal Checklist: "Your deal will go live on our website between 6-9 a.m. PST, and the email will generally be delivered by 10 a.m.-noon PST." Evening of: Start checking Amazon category rankings. Log stats and take screen shots when appropriate. Post the exciting bits on Twitter, Facebook, etc. to reel in more customers. X days after: Raise prices on all platforms—Amazon, Nook, etc.—again. X = the day after the last day of the deal, decided when the BookBub feature was confirmed. From the BookBub Policies page: "If a partner expires a deal early with us more than once, we unfortunately will not be able to continue working with them. Please let us know in advance of the promotion if you need to adjust the end date." Do take that bit of advice seriously; you want to keep drinking from this chalice as often as possible. If you've heard rumors, Carlyn Robertson reveals "BookBub Myths Busted" via BookBub's blog. Most of the "myths" are fairly common sense. It's all pretty much, "Well, no duh" stuff, actually, but the statistics are interesting if you're into that sort of thing. BookBub now offers advertising that's not a "Featured Deal." They offer a great infographic of the difference between ads and featured deals in this blog post. In a nutshell, an ad may describe any book-related content, including audiobooks, print editions, and full-price e-books. Since it's a new program, and authors (including myself) are wait-listed for participation, I'll most likely be blogging about my experiences with BookBub ads at a later date. Don't shy from selecting International promotion when submitting your book's deal for review, even though it's less expensive to do so. 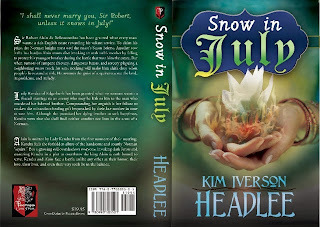 My medieval paranormal novel Snow in July recently was selected only for BookBub's non-US email lists (UK, Canada, Australia, and India). 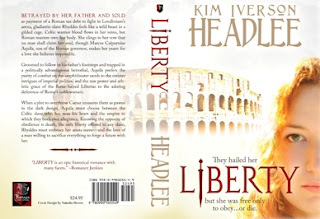 It's considerably less expensive than a US promotion (in my case, $50.00 versus several hundred for a 99-cent book deal), but I still was able to recoup my BookBub investment within the first 24 hours… even though this particular novel is a standalone, and no one has yet (as of two days after the BookBub international feature) bought any of my other novels. The other advantage to accepting an International-only BookBub promotion is that they waive the 6-month restriction for the title in question, and you may submit it for US promotion consideration again in as little as one month. 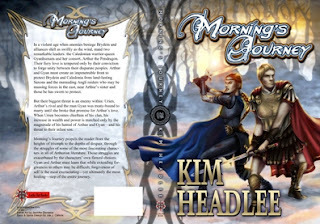 Happy Grail hunting and book promoting! This past week I reached the decision to send part 2 of Raging Sea, Enemies & Allies, to my secondary editor for proofreading. Part 2 represents chapters 7-14 and takes readers to about the halfway point of the story. I have just begun writing chapter 16. My secondary editor is a longtime, in-the-flesh author-friend, and so I am bartering my e-book formatting services for her novels in exchange for her proofreading skills. This means that we are at the mercy of each other's schedules, but she completed her work on Raging Sea: Reckonings in about two months. 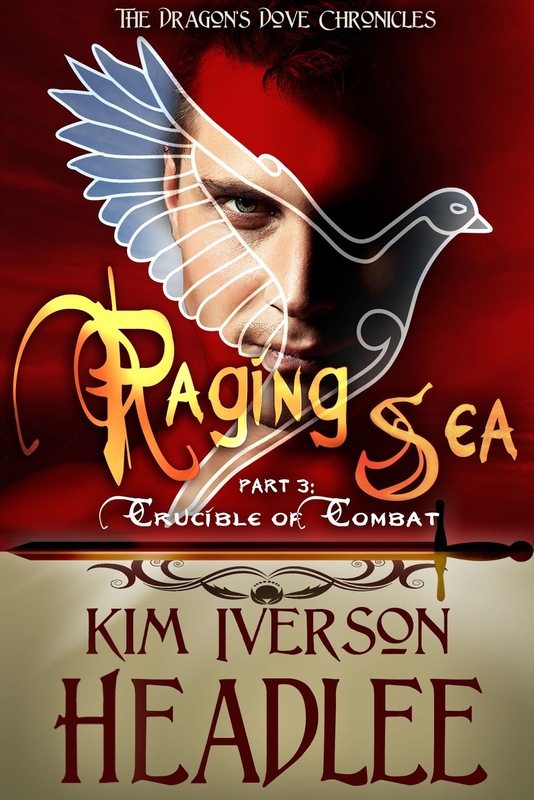 My plan is to make Raging Sea: Reckonings a permafree title once Raging Sea: Enemies & Allies becomes available. Morghe's lips parted in a sultry manner. Accolon knew he should resist their tacit, tempting invitation. But he was already a dead man walking for having let her get wounded. He may as well take a memory of heaven with him into hell. “Only this day?” She feigned a pretty pout, the corners of her mouth quirking upward. As he lowered his lips to hers, she reached up with her good arm and pulled him the rest of the distance. Their mouths met with explosive, demanding force. While staying mindful of her injured shoulder, he slipped his hand beneath the coverlet to discover that the bandage was all she wore. It covered one breast, but the other he tweaked and teased until she began to gasp—and not from pain. She tugged at the laces of his trews. His hand stilled, and he pulled back. “Too late? Do you mean one of us will be dead?” Panic clawed at his gut; he knew damned well which of them it would be. She guided his hand to fondle her nethers. He couldn’t resist that silent command either. The way she arched and moaned excited him as no other woman had done before, and he quickened his sweet assault. This time when she tugged at the knot of his laces, he helped her strip off his trews. She opened to him, and—mindful of her wound, which she seemed to have forgotten in her frenzy—he lost no time burying himself to the hilt. In no time she had him bucking and gasping past all capacity for rational thought. He might doubt her ability to protect him from Urien’s wrath, but this… ah, this would be one damned fine memory to cherish for an eternity in hell. Wolf Creek Indian Village, 6/6/2015. Wolf Creek Indian Village & Museum is located in mountainous and scenic Bastian, VA. It is a "pole for pole and feature for feature" reconstruction of a Native American community dating to the 15th century that was found nearby while transportation workers were building Interstate 77 through that section of Appalachia. The original inhabitants' tribal affiliation is unknown, but local reenactors and living-history interpreters give public demonstrations throughout the year. Each year, Wolf Creek Indian Village & Museum sponsors Family Day for the celebration of Native American culture. This year's Family Day is set for Saturday, June 4th, 10 a.m. – 4 p.m. Come join me and other craftsfolk, singers, dancers, and storytellers in this unique, entertaining, and informative venue! 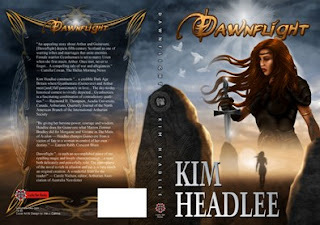 Visit with author Kim Headlee at Wolf Creek Indian Village & Museum 6/4/16. The Business of Writing takes a week off in deference to The Dawnflier, and there's a lot to howl about this month! 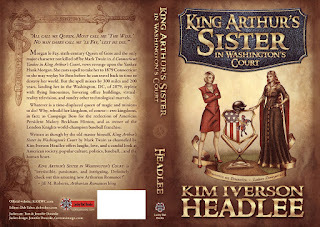 BREAKING NEWS (and a request for crossed fingers :) — King Arthur's Sister in Washington's Court, which in April won the 2016 IBPA Benjamin Franklin Gold Medal for Science Fiction & Fantasy, has cleared two hurdles toward getting a Publishers Weekly review! For those who don't know, Publishers Weekly is THE trade magazine of the publication industry, and they review just a fraction of every book they receive, especially in regard to independently published titles. Even though KASIWC is now in the hands of their review staff, there's still a chance it won't get reviewed; hence the request for crossed fingers, thanks! EVEN MORE BREAKING NEWS — No worries; your fingers are safe for this one. I am pleased to announce the release of Episode 1 (Dilemmas & Deliberation) of my graphic novel edition of The Challenge. Get your Kindle copy today! Subscribers to the MailChimp edition of The Dawnflier have received first crack at my latest Amazon giveaway. I run one every month, so please SIGN UP today (and claim your subscriber gift!) if you don't want to miss out; thanks! Saturday, June 4, 10 a.m. – 4 p.m. Family Day at Wolf Creek Indian Village, Bastian, VA.
Wednesday, June 22, 10 a.m. – 4 p.m. Artist in Residence at Chautauqua Festival, Community Center grounds, Wytheville, VA.
Thursday, June 23, 10 a.m. – noon. Featured Member at Black Horse Artisan Guild, 115 East Main St, Wytheville, VA.
Friday, June 24, noon – 8:00 p.m. Chautauqua Bazaar, inside the Community Center, Wytheville, VA.
Saturday, June 25, 10:00 a.m. – 8:00 p.m. Chautauqua Bazaar, inside the Community Center, Wytheville, VA.
Have a safe and pleasant transition from spring to summer!